This delightfully spiced, aromatic vegetarian dish can be served as either a main course or a side dish. The bounty of vegetables, and especially the potatoes, makes it filling enough for a full meal. I loved the fragrant spice of this dish, especially the mild heat from the chili powder. The tumeric gave everything a lovely yellow hue. 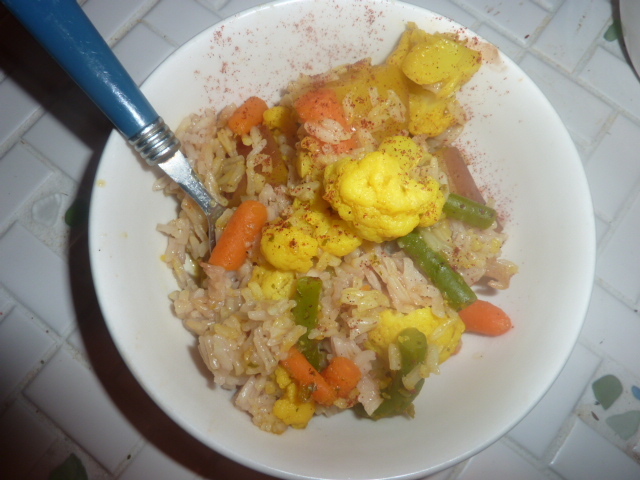 Plus, this dish was amazingly healthy, with zero added fat and several servings of vegetables. I’m glad I planned for a lot of extras, because I have a feeling this is going to make for some excellent lunch leftovers. Put the rice, cloves, and cardamom into a large saucepan. Add stock and bring to a boil over medium-high heat. Reduce heat, cover, and simmer for 20 minutes or until stock has been absorbed. Meanwhile, add garlic cloves, onion, cumin seeds, turmeric, chili powder, cilantro kosher salt, and freshly cracked black pepper into a food processor or blender with about 2 tbs. water. Blend until a smooth paste forms. Add paste, potato, carrots, cauliflower, green beans and about 1/4 cup water to a large sauce pan. Place over low heat and cook 10-12 minutes, stirring occasionally. Add the ground coriander. Remove the cloves from the rice. Transfer the vegetables to a casserole dish and top with the rice. Add lime juice. Cook 25 minutes until the vegetables are tender. Fluff with a fork and serve. This dish was jam-packed with both flavor and nutrition. I hadn’t worked with mustard greens before and was surprised by the intensity of the mustard flavor, but it worked really well with the boldness of the spices. Zak made the naan from a recipe in the book his sis got him for his birthday, The Bread Lover’s Bread Machine Cookbook by Beth Hensperger. 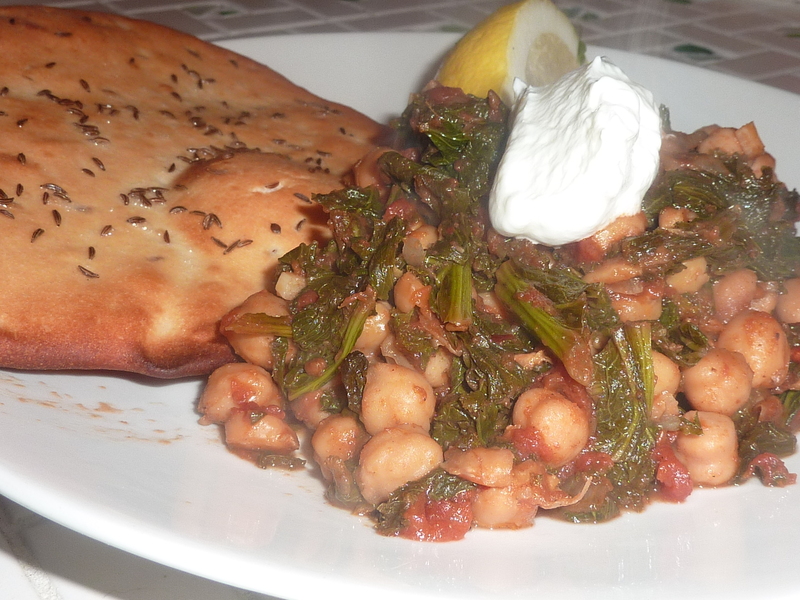 It was absolutely delicious and made a wonderful vessel for the spice of the chana masala with mustard greens. I really enjoyed this healthy, vegetarian dish, especially because it allowed me to make use of some Indian flavors which don’t typically pop up in our kitchen. The leftovers were especially good today for lunch. Bring a large pot of salted water to a boil. Add mustard greens and boil 2 minutes. Drain and run under cold water immediately. Set aside. Add olive oil to a large saucepan or Dutch oven and heat over medium heat. Add onion and cook, stirring frequently, until caramelized, about 40 minutes. Turn heat up slightly and cook another 10 minutes, stirring frequently, until onions are lightly charred in some spots. Reduce heat to low. Add garlic and another tsp. or two of oil if the pan seems too dry. Add cumin, coriander, ginger, garam masala, and cardamom. Add a few splashes of water and stir to scrape up any bits stuck to the bottom of the pan. Cook until water is completely evaporated. Pour in the juice from the canned tomatoes. Add tomatoes, breaking them apart with your hands as you add them (messy but efficient) or break them up in the pan with a wooden spoon or potato masher once in the pan (cleaner but doesn’t work as well). Taste for seasoning and adjust if necessary. Raise heat to medium and bring to a boil. Reduce heat and add the cilantro and sriracha, simmering until the sauce begins to thicken. Add chickpeas and mustard greens and stir to coat thoroughly with the sauce. Cook over medium heat another 15-20 minutes, stirring frequently, until sauce thickens and coats chickpeas and mustard greens. Stir in yogurt, if desired. Garnish with lemon wedges and serve immediately with naan. Place oil, yogurt, milk, 2 cups flour, salt, baking soda, and yeast in your bread machine and program for the Dough cycle. Press start. When Dough cycle is complete, remove dough to a work surface dusted with flour. Divide into two equal portions. Divide each portion into third, and form the six portions into walnut-size balls. Roll each into a 4″-5″ flat round or oval shape about 1/2″ thick. As they are shaped, place them on the baking sheet. Cover with a towel and let rest for about 20 minutes. Flatten each round with your palm and stretch on one side to make an 8″ x 4 1/2″ elongated oval. Brush the top of each naan with the melted butter and sprinkle with carraway seeds. Bake until golden brown and crisp for about 8 minutes. Serve immediately. Just like The Pioneer Woman, from whom I adapted this recipe, the first thing that comes to my mind when I hear the word “mulligatawny” is the Soup Nazi episode of Seinfeld. We are big, big fans of Seinfeld in this house. Both Zak and I have seen every single episode at least a dozen times each. We grew up watching it – before I understood what the heck was going on, probably. The Soup Nazi is still one of my favorite episodes, and it makes me laugh out loud just to think about Kramer describing the delicious mulligatawny and how the Soup Nazi is a misunderstood genius who slaves and suffers over his soup. Well, this soup requires very little suffering on the part of the chef. The great thing about this soup is that you can throw just about anything hanging out in your crisper in and have an extremely flavorful and healthy meal on your table in less than an hour. If you don’t like spicy food, add a little bit less tikki masala and skip the crushed red pepper flakes, as this was pretty spicy. Next time, I think I’m going to dice up a small tomato and add it, because I think it would work really well with this. In a medium stock pot, add Brummel & Brown and melt over medium heat. Add diced onion and garlic. Season with freshly cracked black pepper and kosher salt. Stirring frequently, cook 3-5 minutes until soft and translucent. Add potatoes and cook 10-15 minutes until potatoes and onions are starting to brown. Add flour to onions and potatoes and stir to combine. Add curry powder, tikki masala, crushed red pepper flakes, and turmeric powder. Cook, stirring, until fragrant, 1-2 minutes. Add in chicken stock, stirring to combine. Bring to a slow simmer. Meanwhile, whisk together water and plain Greek yogurt. Once chicken stock is at a simmer, slowly whisk in plain Greek yogurt/water mixture. Taste for seasonings and add kosher salt and freshly cracked black pepper as necessary. Add chopped roast chicken, apples, and kohlrabi. Cook for another 10-15 minutes until heated through and slightly tender. 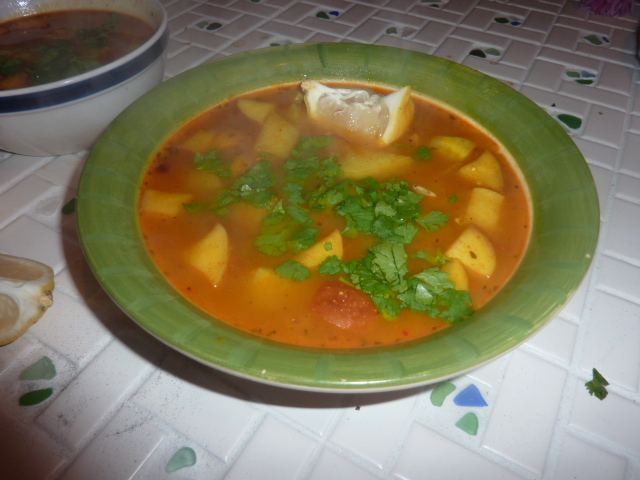 Serve with lemon wedges and fresh cilantro.